Nimble offers a variety of ways to upload your Office 365 contacts and their associated contact details to your account. Whether you have an Office 365 subscription or want to upload from an Outlook CSV file, this support article's got you covered. 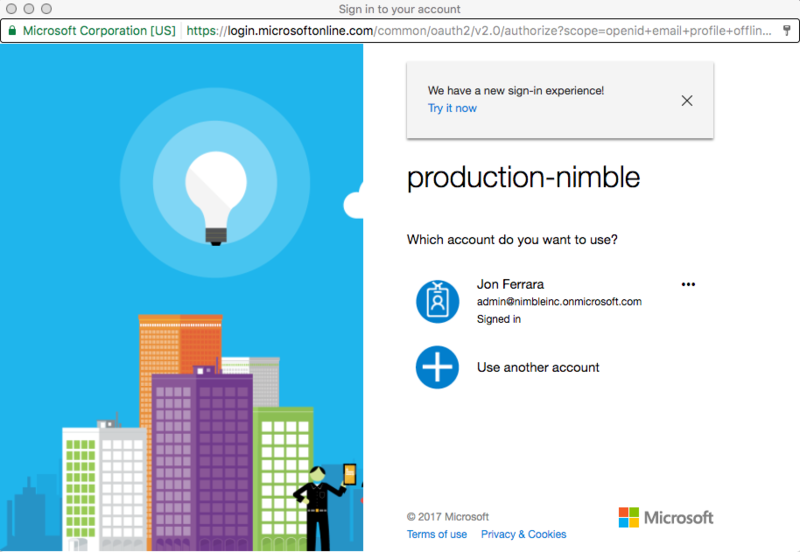 Nimble enables Office 365 subscribers to import contacts from their account via the REST API. It's important to reminder that all contacts in your Outlook account from the "Your contacts" list will be added to Nimble. If you would rather control which contacts are added to Nimble, you may consider using the Outlook CSV importer instead. Instructions on how to use this importer can be found in the next section below. In Settings >> Networks & Imports, choose "Office 365 Contacts & Group Message"
A pop-up window will display giving you the option to sign into an existing Office 365 account. Choose which account you would like to sign into or click "Use another account." After signing in, your Office 365 account will be synced to Nimble. That's it! The account should now be connected and you'll be able to send Group Messages and import your Office 365 connections. You may consider using the Outlook CSV importer if you have a controlled list of contacts that you would like to upload to Nimble. Controlling which contacts import to Nimble will ensure that you start your Nimble experience with a clean database of contacts. Once your contacts have exported, you may consider looking it over to remove any unwanted contacts from the file prior to import. To start the import process, visit Settings >> Networks & Imports and search "Outlook CSV". 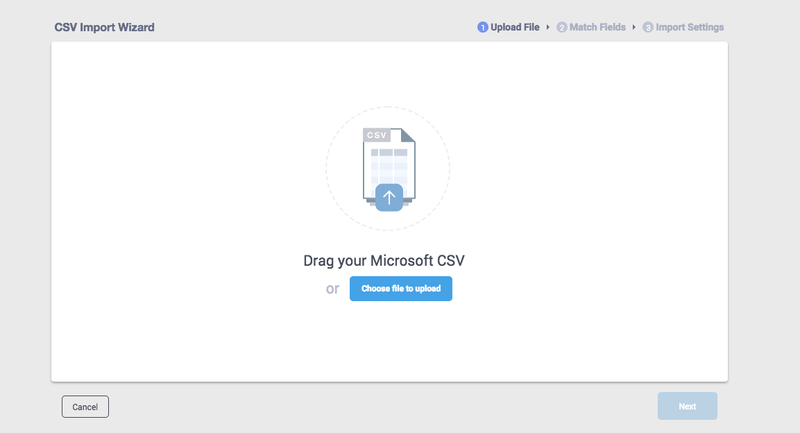 Click "Import CSV File" then upload or drag your CSV file onto the Import Wizard. Select "Next", and utilize the CSV Import Wizard to map the headers from your CSV file to fields that exist in Nimble. On the third page of the import process, you are provided with overwrite options. If you are running this import periodically then it is important to be mindful of your merging options to avoid duplicates. Tip Alert: Nimble merges duplicates based on email address. If some of the contacts in your file do not have an email address, then you may choose to merge on name when email address is not present. 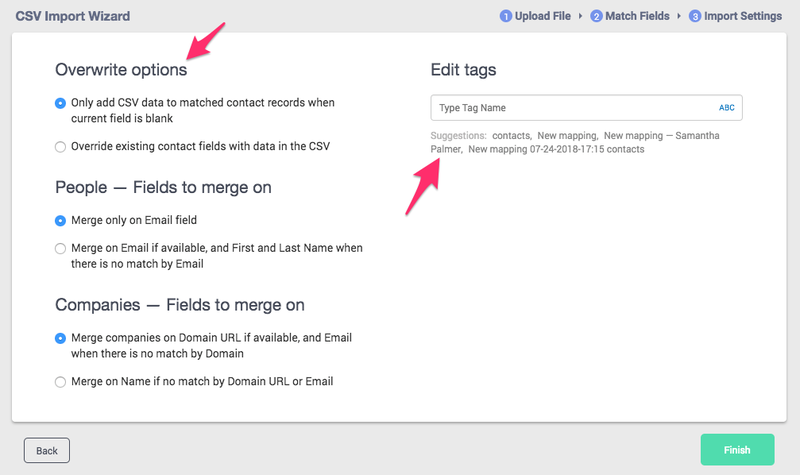 After selecting your overwrite options, be sure to apply a tag to your import, so you can easily locate your contacts later. Then click "Finish" to import your contacts. What else can I do with Office 365 and Nimble? - We offer a full integration with Office 365 enabling you to create a bidirectional sync for your emails and calendars and import your contacts as demonstrated above. Take our Nimble Smart Contacts App with you in Office 365 to learn more about your leads and contacts. If so, please write us at care@nimble.com, initiate a chat from this FAQ, or join one of our Nimble Onboarding and Best Practices sessions, held every weekday at 9 AM PT.